2005 MY: New Type 997 Carrera 325bhp) and Carrera S (355bhp) introduced October 2004. Coupé only with manual and Tiptronic gearbox options. Cabriolet introduced in April 2005. 2006 MY: Carrera 4 and 4S models launched. 2007 MY: 911 (997) Turbo (3.6-litre 'Mezger' engine with max 480bhp) introduced July 2006. 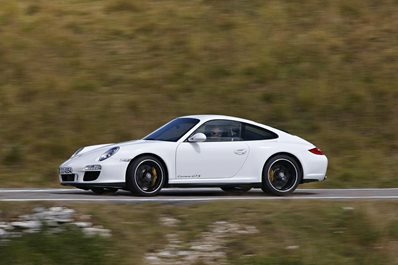 Following month GT3 launched with 415bhp (Mezger) and Carrera Targa 4 and Targa 4S in November 2006. March 2007 sees the GT3 RS (415bhp) launch. Same power as GT3 but 20kgs lighter. 2008 MY: In September 2007 the Turbo Cabriolet is introduced with the GT2 (530bhp, Mezger) following in November. 2012 MY: With start of 991 production for Carrera and S, 997 Carrera 4 and 4S (including Targa) continues to MY end, when all 997 production ceases. 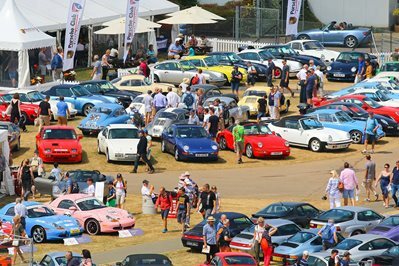 The 997 represented a significant relaunch of the 911 that included a major body restyling and interior update, while using much of the rolling chassis of the outgoing 996. This included an uprated version of the water cooled Carrera engine - now offered as a 3.6-litre for the Carrera and a 3.8-litre for the Carrera S.
As with all new 911s, both Carreras undoubtedly offered a better package than the previous models and the restyle in particular gave the 997 a more classic attractiveness that was arguably missing on the 996. For everyday driving, the maximum power differences are minimal, with the 3.8S offering better overtaking flexibility. Like the 996, the 997 models offer 2 + 2 seating with the rear accommodation being OK for medium build adults for short journeys. Fitting child seats is straightforward. The rear seats fold down to make extra storage space, while the front compartment can fit two appropriately sized (small) suitcases. The Tiptronic gearbox is ideal for urban life and most will use the car as a full auto for most of the time. The Porsche Active Suspension Management (PASM) on the S has a good, but firmish ride for most roads, while the Sport setting feels every bump. All the models have assisted steering and brakes, making them easy for all builds of driver. The plastic backed sports seats aren't for everyone. The factory option list has various desirable seats that offer increased adjustability, support and height. The Cabriolet models do not have the hardtop included (as did the 996), and offer a fully electric deployment of the roof. The Targas offer an airy cockpit feel with a very useful opening rear tailgate. For everyday driving few would be able to tell the difference between the rear wheel drive only Carreras and the all-wheel drive models. The C2 is perhaps slightly more agile into faster bends, while the C4 - with the right tyres - might offer advantages on slippery surfaces. The faster 911s (except the Turbo Gen 2) use the well proven 'Mezger' engine, which has a bullet proof reputation (with obvious conditions applied). The Turbo offers a very attractive, very high performance package that will only appeal to the Alpha driver. The GT3 is surprisingly tractable as an everyday driver, but is nonetheless track focused. The RS is one for the collectors, although again it is surprisingly driveable as an everyday car. There were a number of 'run out' models offered towards the end of the 997's life, but all were usually larger budget special editions aimed at collectors. The exception was the 911 Black Edition for the 2011 MY. Based on the 3.6 Carrera, this was an all-black themed edition with some useful options such as Bose sound, Cruise, rear Park Assist and the PCM sat-nav. Like all modern Porsches you should not need to feel intimidated by the mainstream 997 models. All are easy to drive and live with. You will notice the immediate differences from a premium saloon in the car's on the road liveliness, handling confidence and massively powerful brakes. These common good features make even the base Carrera a very attractive package, especially when it has the key desirable factory options. These include Porsche Communications Management (PCM 2 on Gen 1, the far better PCM3 on Gen 2), Bose sound system, Cruise control and rear Park Assist. Nice to have options are the fully adjustable and memory seats, Xenon headlamps and on the Coupé, a tilt/slide sunroof. Perhaps the most popular toy is the Porsche switchable Sports Exhaust (PSE). This allows the driver to switch to a deeper (louder) exhaust note for those moments when you feel the world is against you. Wheels are more than just a matter of appearance. The standard Carrera S 'lobster claw' 19-inch wheels have very little tyre sidewall compliance and only work because of the softer 'Normal' PASM setting. That makes 19-inch wheels on cars with just the 'coil spring/shock' suspension hard work in terms of ride quality. For two pedal driving, Tiptronic is a great option for Gen 1 cars, but Gen 2 models offer the excellent PDK auto gearbox. The 997, like most other Porsches, is an ostentatious automobile and many will prefer the more conservative colours available. These include the dark metallics and solid black, although by far the most popular colour back in the mid-Noughties was Arctic Silver. As with all modern Porsches, the running costs for a well sourced example should be similar to a premium saloon. Service intervals are every two years or 20K miles, whichever comes sooner. Correct servicing is a critical requirement on all 997 models, which includes routine checking of the coolant system. Servicing costs vary across the country but would typically range from £300-600 + VAT (depending on whether you need a Minor (Intermediate) or Major (Maintenance) service and excluding items like brake fluid change, spark plugs and other wear and tear parts. General wear and tear items include replacement/rebuild of the air conditioning system. The condensers last around six to eight years in the UK and rebuild cost will be about £1200. Typical clutch replacement is likely to cost £1K (obviously not required on a Tiptronic, although a noisy torque converter should be treated with caution). Clutches can last from 40K miles (a city car) to as much as 80K miles. Rear main oil seal (RMS) oil leakage can affect 2005-2006 Carreras, but not 2007-onwards cars (which also feature a stronger IMS bearing). Brake wear depends on driving style, but for a manual 3.6-litre car, these typically should last 20K miles. To replace the front discs, pads and pad wear sensors is likely to cost £600 with a similar amount for the rear axle. The most frequent engine wear and tear item on the Gen 2 Carreras is the tandem vacuum pump. It corrodes out after about 10 years and starts to leak oil from the back area of the engine. It will cost around £500 + VAT to replace. The Mezger engined 997s have similar body and suspension issues as the Carreras, while the Turbo wastegate actuators should always be checked for free movement. The forums are full of horror stories concerning cylinder bore scoring and failure of the intermediate shaft (IMS) bearing in the Gen 1 Carrera engines. However, cylinder scoring has only affected a small percentage (perhaps 5%) of Gen 1 (pre DFI engine, 58-plate) cars. In our experience it is the larger engined models (the 3.8S models) that are more prone. Most experts would suggest an IMS bearing failure is low risk, but a stronger item was fitted approximately from the start of the 2007 MY (56 plate). The leaky rear main oil seal (RMS) issue that blighted so many of the 996 models was largely resolved by the 997 models. Many reputable dealers will repaint the front bumper or all the frontal area panels to eliminate unsightly stone chips. This is not something to be concerned about, assuming the colour match and finish is good. That said, these are fast sports cars and accident damage is quite common. It's always worth checking for signs of paint lines in the door shuts, while a paint thickness gauge can spot filled in minor damage and heavier collision signs (the latter may require experienced interpretation). Any kind of non-factory customisation is a negative. Select your car based on condition, mileage and service history first, then filter by less important items like colour and options. Low mileage isn't always a guideline to condition as, for instance a London based Tiptronic Carrera may have a worn engine from too many cold run short cycles and inevitable scruffy body and wheels. Coolant system condition is important, so check for reservoir cap, radiator and hose leakage. A heavy clutch pedal can suggest the clutch is in its last 10% of life. Always try to drive the car before you buy. There is no substitute for taking a short run and appreciating whether the car is easy to live with. If you sense anything isn't quite right, it probably isn't. Always switch PASM from Normal to Sport (and Sport Plus if fitted) to sense the change in ride. Similarly try out all the accessories, including PSE if fitted (as the flaps in the exhaust can seize). With the faster 911s, some experience of their standard performance, ride and handling is invaluable as wear and tear can be higher than the mainstream models.